Explanation: Gaze across the frozen canyons of northern Pluto in this contrast enhanced colour scene, imaged last July by the New Horizons spacecraft. Currently known as Lowell Regio, the region has been informally named for Percival Lowell, founder of the Lowell Observatory. Also famous for his speculation that there were canals on Mars, in 1906 Lowell started the search that ultimately led to Pluto's discovery. 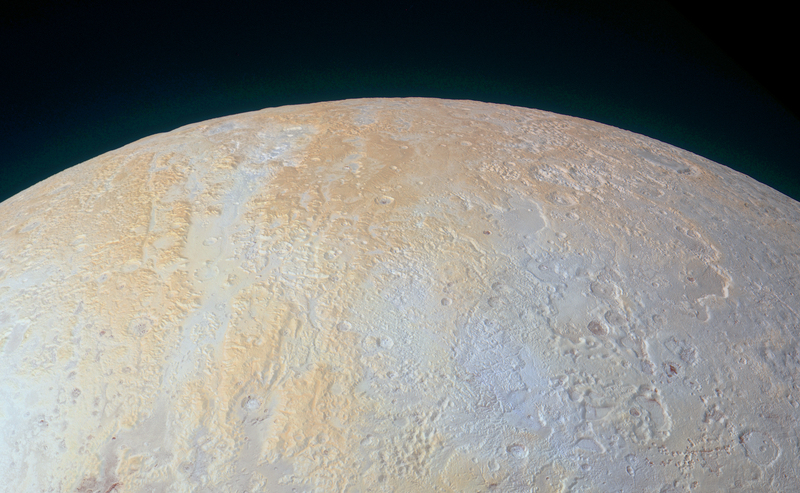 Pluto's North Pole itself is above and left of centre in the the frame. The pale bluish floor of the broad canyon on the left is about 70 kilometres (45 miles) wide, running vertically toward the south. Higher elevations take on a yellowish hue. New Horizon's measurements have determined that in addition to nitrogen ice, methane ice is abundant across northern Pluto's Lowell Regio.